WHEN Joe Butler comes to Bundaberg to dance, he steps onto land that is his by blood. He was taught to dance by his grandfather and speaks Gurang, Taribelang, Goreng Goreng and more from around the area. He passes what he knows onto his sons, including Trey and Brandon, above, who joined him to dance in Buss Park yesterday to kick off Naidoc Week. NAIDOC: Why it's important to keep indigenous language alive: Naidoc Week kicked off in Bundaberg with a flag raising ceremony featuring traditional song and dance. This year's theme is "Our Languages Matter" and here dancer Joe Butler and Gidarjil's Kerry Blackman talk about why it's important to keep language alive. "I do it because I love the culture,” Mr Butler said. This year's Naidoc Week is all about sharing and passing on: the theme is "Our languages matter”. Gidarjil Corporation chairman Kerry Blackman said the week was about "promoting our strong culture”. "A strong culture means strong people,” he said. 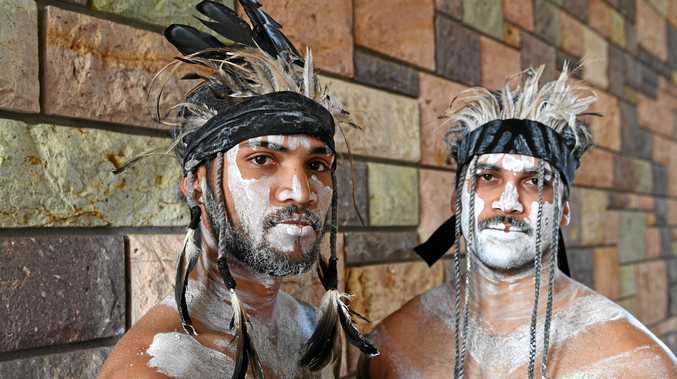 "There's a great revival and maintenance going on of aboriginal languages throughout Australia. Last night local indigenous youth starred in a play at the Moncrieff, No Buus on the Bus, in Gurang and English.